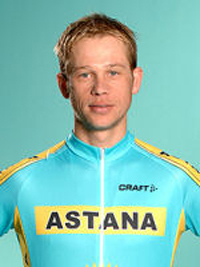 After "B" sample of Andrej Kashechkin tested positive for a banned blood transfusion Astana fired him. "Andrej Kashechkin from now on is dismissed with immediate effect," the team said in a statement Friday. Kashechkin first tested positive during an unannounced control on Aug. 1 in Belek, Turkey. He was suspended from the team a week later pending analysis of his backup sample. Kashechkin finished third in this year's Dauphine Libere race. He finished fourth in the 13th stage of the Tour de France. Astana is trying to put a series of doping scandals behind it and return to competition following a monthlong self-imposed suspension. The entire Astana team left the Tour de France after Alexandre Vinokourov, a race favorite, tested positive for a blood transfusion following his victory in the 13th stage time trial. Matthias Kessler was then fired after his "A" and "B" samples from a test in April showed elevated testosterone levels. Astana was expected to make its comeback at the Spanish Vuelta, starting Saturday, but organizers in Spain revoked the team's invitation because of the doping incidents. The team still has German rider Andreas Kloeden, who is expected to decide Friday whether to race in Sunday's Grand Prix Ouest de France Plouay. Kloeden injured his hand and hip in a road accident during training on Thursday. Meanwhile, team manager Marc Biver - who was summoned by UCI ProTour council president Vittorio Adorni to explain the doping cases - is considering his future at Astana. Previously known as Liberty Seguros, the Switzerland-based team returned to the Tour this year after being banned in 2006 when several of its riders were linked to Operation Puerto, a Spanish doping investigation that has implicated more than 50 riders.